Senegal's president Abdoulaye Wade urged African leaders and the West to join forces in the fight against al-Qaeda's North African branch, saying it has to be done to prevent the Sahara from becoming a “terrorism desert.” Abdoulaye Wade's appeal came as African Union heads of state gathered to tackle the continent's crises and conflicts at the bloc's summit in Addis Ababa, Ethiopia. Alexander Tkachenko, head of the Center for North African Research, talked about the issue with Pravda.Ru. The main part in North African al-Qaeda is currently played by the Salafist Group for Preaching and Combat, created in Algeria in the late 1990s. Since then, the group has expanded its military actions and is not limited to Algerian territory. 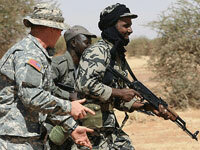 The group’s militants were seen all over North Africa, especially in Chad, Nigeria and the Republic of Mali. There are significant extremist forces in North Africa. Yet, we cannot say that Senegal and other countries in the region are alone in their struggle. Western military presence in North Africa has been steadily increasing year after year. In particular, American Special Forces and military aviation have been fighting African Islamist group under the Operation Enduring Freedom — Trans Sahara или OEF-TS for six years. Initially, the program was aimed at training anti-terrorist personnel, but now the officers participate in operations designed to intercept weapons and drugs contraband channels. Since 2005, the US Special forces have been conducting specialized anti-terrorist training under the state program The Trans - Sahara Counterterrorism Partnership (TSCTP). The training participants are Algeria, Burkina Faso, Libya, Mauritania, Morocco, Tunisia, Chad, Mali, Niger, Nigeria, and Senegal. Americans spent over 0.5 billion dollars for the anti-terrorism struggle. Yet, the situation has only worsened with the increased number of terrorist attacks. The struggle against North African al-Qaeda is complicated by constant migration of militants through hard-to-reach areas of the endless Sahara desert. The situation has particularly worsened in the past two years. These years were marked both with the increased frequency of attacks as well as their impudence, i.e., police station attacks and embassy shootings. The leaders of the Maghreb Muslims appeal for jihad against ruling governments of North African countries. All this attests to the fact that the officials cannot properly control the situation even in their own capitals. Last year, media released alarming information stating that the Islamist group was developing biological weapons, and in particular, was experimenting with plague agents. The war on terror affects the well-being of local residents increasingly more each year. According to experts, the struggle with al-Qaeda caused rise in basic consumer goods prices in Algeria, including potatoes prices. In 2009, the Islamist group inflicted several significant strikes at the Mali government. On June 11, in the city of Timbuktu, they shot Lt Col Lamana Ould Cheikh, one of the leaders of the local intelligence services involved in the struggle against terrorists. Later, the army tried to eliminate Islamists’ camps near the Algerian border. The fights had been continuing the entire summer, and as a result Mali Special forces had lost over 50 people. In other words, the participants of the Pan African summit had good reasons to be alarmed. On the other hand, as mentioned above, so far the US military aid has not yielded positive results in the struggle against several hundred militants. Under the circumstances, the opinion of an Algerian expert Jamal Gessel shared with Pravda.ru was quite surprising. He said that there was very reliable information suggesting that the Islamist group was supported by CIA. Analysts of the French and Algerian Special forces (e.g., DGSE, France) are convinced that this is done to destabilized the situation in North African countries rich in natural resources (both oil and uranium). The other goal is to force French and Spanish oil-extracting competitors out of the area. The expert believes this is precisely why the Islamist group’s attacks are aimed against the French and Spanish, and why the American presence in the region is not effective. Additionally, the expert does not rule out the situation when the US declares the region its strategic zone, like it happened in the Persian Gulf, and instills its hegemony in the area. The conclusion is the following: the hopes of North African countries to receive aid from the West greatly depend on what they mean by “West”, the USA or EU.